I have often envied people who can draw. My own efforts remain crude creations, but it does not stop me from appreciating the work of others. Like many people, comics have played an important part in my life and while I no longer spend hours in comic book shops searching for an elusive missing issue the art form still hold interest. 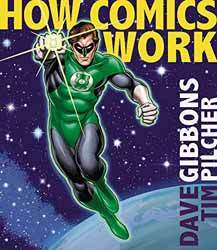 There are many fine books on the market on how to draw comics, but Dave Gibbons and Tim Pilcher decided that what was missing was a book on how a comic goes from original concept to that little marvel of paper, ink and colour that still has the power to either offer outlandish thrill or to make you think about the world. How Comic Work (2017. 192 pages) written by Dave Gibbons and Tim Pilcher is a large format book which sets out to examine just how a completed comic is produced. Gibbons is a highly regarded and successful comic book artist and writer, a list of his work would be too long to include in a piece of this size. It is simpler to say that he won the Jack Kirby Award for Best New Series for his seminal work on Watchmen. Pilcher is no less successful having, among many other things, co-created Preacher. Comic books, like any other collaborative medium, are created via a multi staged process, each part of which will be influenced by the creator's own personal tastes and influence. The book breaks down the process of creation into a number of broad chapter headings, Scriptwriting, Visual Groundwork, Sequential Storytelling, Lettering, Colouring and Design. Each of these chapters is further broken down to examine how and why they work within comic books. Each chapter starts with a piece on the artist's early influences and if they are related to comics there is an example of the artist’s work. The chapter then goes into detail in how a particular process works in the real world. It is the level of detail which is illuminating. Why are panels used and why place the speech bubbles in a particular place? The book studies the ideas of pacing in a story and the way that the artist can direct the readers gaze for a particular response. The chapter on story telling goes into some detail in how mind maps are used when constructing a coherent narrative. The book is generously filled with examples of comic book art and not just from the two authors. From full page spreads to inset panels, there isn’t a single page which does not contain some level of artwork and the larger format of the book works well. The book is similar to those which attempt to explain how films work, that everything that you see has been worked out in careful detail. Just as a director does not just point a camera at a bunch of actors and hope for the best, neither do comic creators place anything on the page without knowing the reaction they are trying to achieve. Both mediums have a language and the appreciation of the underlying language will only enhance your enjoyment.